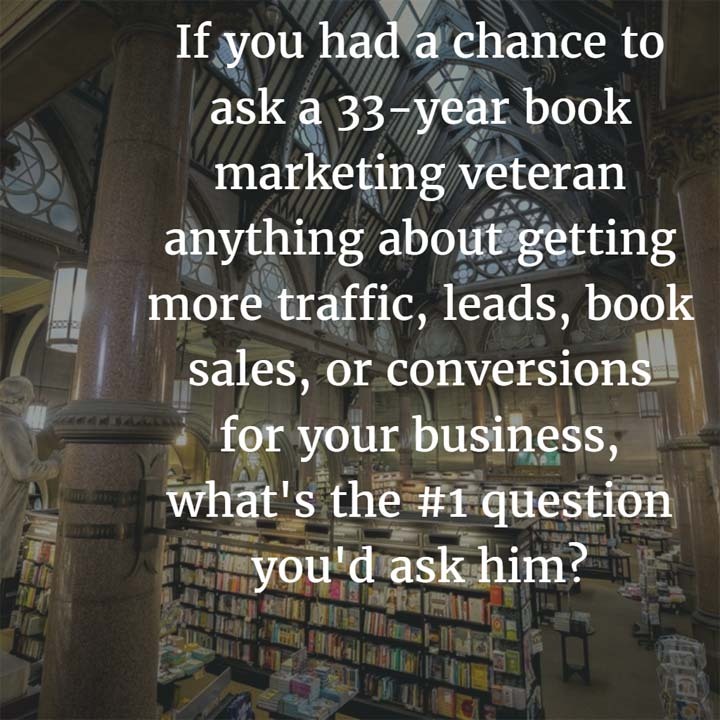 Here are a few of the book marketing questions (with my answers) that I got today after posting the following on my personal Facebook timeline: If you had a chance to ask a 33-year book marketing veteran anything about getting more traffic, leads, book sales, or conversions for your business, what’s the #1 question you’d ask him? Tara Penelope Calishain: Is it worth it to still write books? John Kremer‘s Book Marketing Answer: It is absolutely worth still writing books. People still value books – and buy them! Kaye Curren: How do I get people to read my blog??? John Kremer‘s Book Marketing Answer: Write really interesting stuff, and then ask your friends to send traffic to that interesting stuff. Ask your social media followers. Ask key influencers. Ask your family. Ask fellow bloggers. Ask joint venture partners. And ask me. Kaye Curren: Thanks, John. I thought we shouldn’t do that or they would get miffed and leave. John: Your family might leave, but your followers who love you will always send traffic to good content. Actually, your family will not leave. At least mine hasn’t yet. And I love them still, even after 68 years. Kaye Curren: John, Will you send traffic to my website/blog www.writethatthang.com? Thank you. John: Done. Kaye’s blog covers writing, living and other stuff. Kaye, you should get some traffic from this post. And you should get traffic for months and years to come, because this blog post will be here for a long time. Note: Kaye is about to launch a book of humor essays on an elder lady’s take on the last 70 years. If you like humor, check out www.writethatthang.com. Tim Hutchinson: What’s more important; social media or website SEO? John Kremer‘s Book Marketing Answer: In my experience, I get more sales and more traffic from good website SEO. I’m very good at that. Having said that, I do get a lot of traffic from Pinterest and Facebook, but not many sales. I actually get more traffic on some of my websites from Pinterest and Facebook rather than SEO, but as I said, SEO traffic gets me the most sales. FYI, yesterday 84 people came to my http://BookMarketingBestsellers.com website via search engines. 8 came via Facebook. 9 came via Pinterest, and 1 came from Twitter plus, of course, there were other sources of traffic as well. Linda Nixon Fulkerson: What’s the best tip for authors to grow an email list quickly? Thanks for taking our questions!! 1. Facebook ads targeted to the audience you want to reach. Offer a free valuable download related to your topic and audience. 2. Lots of friends and key influencers sending traffic to a great download offer. 3. Just one key influencer in your area who has grown to love you and is willing to say good things about your work and your newsletter. And willing to send their traffic to you. One book author got 10,000 added email subscribers from one mention by a key influencer. 4. Ask your current email subscribers to share your work with just one other person. Encourage your readers to share your newsletter freely. Make it clear that they have full right to share your newsletter with others. Beth Nydick: Can u sit with me for half an hour and go over my biz? John Kremer‘s Book Marketing Answer: I can, but I do charge for that. That’s a big commitment of my time. Beth Nydick: I’m sure your worth it. John: I am worth every cent. And every dollar. And every euro. And every bar of gold. And every solid indisputable bar of latinum! Ann Manatt: What is the key for sustainability of an online business into the future? How do we position ourselves to be competitive as things move and change? John Kremer‘s Book Marketing Answer: The key to my online business for the past 33 years has been good content. That’s what brings me traffic and sales. Good content never goes out of style. Good content is never affected by Google or Facebook changes. Good content attracts the people who really need your help, advice, good humor, and love. Ann Manatt: Thank you, John. I appreciate that. So of course now I would ask, what makes content “good”? John: It helps people. Good content always helps people. YOUR good content would be that content that helps the people you are trying to reach with your website, newsletter, blog, book, social media, and other services. Ann Manatt: I love your laser clarity. I am committed to helping. And I am about to have 3 coaching calls … so you have given me a perfect focus as I move into them. Bless your generosity. LaDawn Edwards: What is the best way for my church to attract attention of Millennials? John Kremer‘s Answer: I love the power of prayer, so I would begin by adding a prayer for millennials in every service and in every thought. As for more practical activities, start a blog and newsletter only aimed at millennials. Give them practical spiritual advice on how to handle all the challenges that come their way in this modern world. That’s my short answer. Obviously, I could go into much more detail on this idea, but you should have enough here to get started. Jack Humphrey: How do you get ideas for engaging Facebook posts? John Kremer‘s Social Media Answer: First, I have to admit that I stole this idea from you. I had no idea that it would draw such a big response so quickly. Thank you for that. So, the answer to your question is clear: I get ideas for engaging Facebook posts from the people I love and follow (like you). Basically, I steal them. Allen Klein: My next book will be published in September. What is one thing I should do now? John Kremer‘s Book Marketing Answer: Start promoting now. Especially, start finding champions for your book (your social media followers, people who comment on your blog, your email newsletter subscribers, key influencers, etc.). You can never start too early in revving up your champions. Ken McArthur: Hey John, I plan to be able to ask LOTS of questions when you speak at the The Impact Event in Denver! John Kremer‘s Book Marketing Answer: And I will have lots of answers! 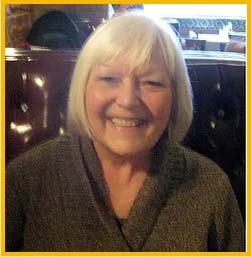 Barbara Cadwell: What is the best way to begin marketing a book? John Kremer‘s Book Marketing Answer: Tell your family what you are doing. That’s always the best way to begin any new activity. Of course, also share what you are doing with friends, social media followers, podcast listeners, etc. Personally, my favorite way of marketing is one of the top ways I encourage every author to do: Speak. Speak wherever anyone will listen. Stand up on a soapbox. Speak at your local library. Speak at your local bookstore. Speak online. Create a podcast. Do a video. Note: You don’t need an invite to a bookstore to speak (if you are brave enough). Just start speaking. In the middle of the aisle. At the cash register. In front of the store. In the stockroom. I share what I do when I’m standing in line at the grocery, or post office, or a bookstore, even the library. Sometimes that embarrasses my wife. But she knew what she was getting into when she married me. Michael J. Herman: With so many spinning plates, which one is the most important one on which tho focus the most? John Kremer‘s Book Marketing Answer: That’s easy: The one that brings you the most sales. If you are tracking the things you do, you should know which of your activities produces the best results: gets you the most subscribers, gets you the most followers and, most important, gets you the most book sales. Of course, sometimes you don’t always know which thing you do will produce the best results over the long term. When in doubt, do these two things: Create relationships (with followers, with influencers, with bloggers, with podcasters, with bookstores, with producers, with event hosts, etc.) and create great content. Do those two things and you will always get great results. Joyce LaFray: What will it cost to market my book? 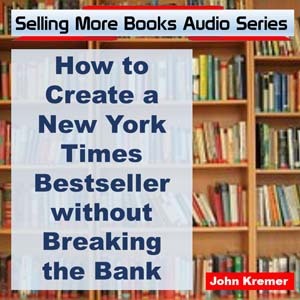 John Kremer‘s Book Marketing Answer: Marketing your books can cost nothing but your time, or it can cost hundreds of thousands of dollars (to create a New York publisher bestseller), or anywhere between nothing and hundreds of thousands. Generally, most authors and publishers spend about $1.00 per book sold for marketing. If you are spending more than that, you better have a good upsell (coaching, higher-priced add-on product, membership site, or speaking). Winnie Anderson: Is it possible to get an industry star to review your book? What’s the best way to do that and what if you don’t have a connection to get you in? John Kremer‘s Book Marketing Answer: It is possible to get an industry star or key influencer to review your book. Start by asking if you can interview them for your podcast (or video series or teleseminar). Or find a friend who has interviewed them, or gotten a testimonial from them, or has featured them in their blog or social media somewhere. Or, finally, go to a conference where the star is speaking. Ask her at the conference. Johannes Linstead: Is it better to self-publish or is it advisable to sign with an established publisher? How soon do you want to get your book published? The sooner you want it published, the more likely you’ll want to self-publish. Do you hate to do marketing? Do you hate meeting new people? Would you like most of your marketing done for you? If so, then sign with an established publisher because as a self-publisher, you have to do all the marketing. Do you already have a platform or audience of your own? Then self-publishing might make sense. Do you want money upfront? Sign with an established publisher. Do you have lots of money already and can you afford to publish and market your book yourself. Then self-publish. Are you ready to move on to write your next book? Then you might want to sign with an established publisher and let them do most of the marketing (which they are, alas, likely to do badly). Those are just a few of the considerations for any publishing endeavor. They are not the only ones. Diane Frank: What’s the best way to get on national radio? John Kremer‘s Book Publicity Answer: Solicit each radio show directly. You can find their contact information on their websites. Tell them why you’d make a great interviewee for their show. How can you entertain, inform, or inspire their audience? Send them at least five questions they can ask you. These questions should lead to interesting answers, not the standard why you wrote the book, what inspires you to write, etc. Those are boring and do not lead to unique answers that inspire listeners to seek out and buy your book. John Kremer‘s Book Marketing Answer: Ah, this is such a general question. The only way to answer it is to write a book. I did that. 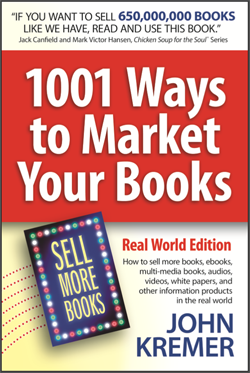 Check out 1001 Ways to Market your Books: http://bookmarketingbestsellers.com/1001-ways-to-market-your-books-real-world-edition-book-cover. Frank DeVito: How does one get an established publisher? I thought one needed a literary agent which is difficult to get because of their many rejection letters. John Kremer‘s Book Publishing Answer: It’s actually easier to get a publisher than it is to get an agent. That’s because editors at book publishers tend to specialize far more than agents do. 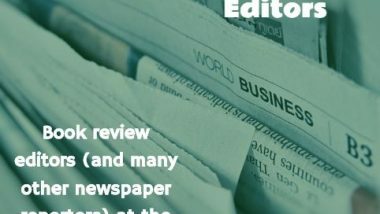 For most nonfiction books, you can target editors at specific publishers with a one- or two-page query letter describing your book and target audience. Be sure to add why you chose them. The reason? Because they have published a great-selling book similar to the one you are proposing. Target only publishers who have published a book similar to the one you are writing. As for fiction, you really need an agent. Or the opportunity to meet editors. That’s a good reason for attending writer’s conferences where agents and editors speak (and often meet with attendees to hear about their books). MaryAnn Faubion Kohl: Are you “really published” if you pay a company to publish your book? John Kremer‘s Book Publishing Answer: You are really published if your book is published as an ebook or a printed book, no matter how it comes about. That said, your book probably won’t sell many copies if you’ve paid the wrong company to publish your book. In most cases you are better off publishing your book yourself (see advice here: http://bookmarketingbestsellers.com/how-do-i-get-my-books-published) or getting a good mid-size publisher to fall in love with your book and marketing plan (and you!). Gale Leach: What’s the best strategy for marketing self-published novels for children (chapter books)? Seems like the target is really parents (moms), which is too broad to be helpful. Get reviews in the library journals. Libraries, especially school libraries, buy a ton of books. Get a good review, and you’ll get lots of orders via library wholesalers. Speak at schools. Arrange for speaking engagements with elementary classrooms and media rooms (libraries). If you don’t know how to arrange such events, ask your favorite teacher for advice. Or school principal. Or media specialist at your local school. Or the leaders of your local PTA. Someone among all those people should be able to tell you how to book a speaking event at your local elementary school. Then take your show on the road. When you book an event, be sure to send flyers to the teachers or media specialists who are hosting you at the school. Ask them pass them out to the children before your appearance so parents have an opportunity to complete the order form and send money with the kids to buy your book. Note: You should also get paid to speak at schools. You might start with a few free events, but eventually you should be paid to do events in schools. Speak at bookstore children’s hours. Most independent bookstores and many chain stores host reading events for children (and their parents). They invite authors to read to the children and answer questions. 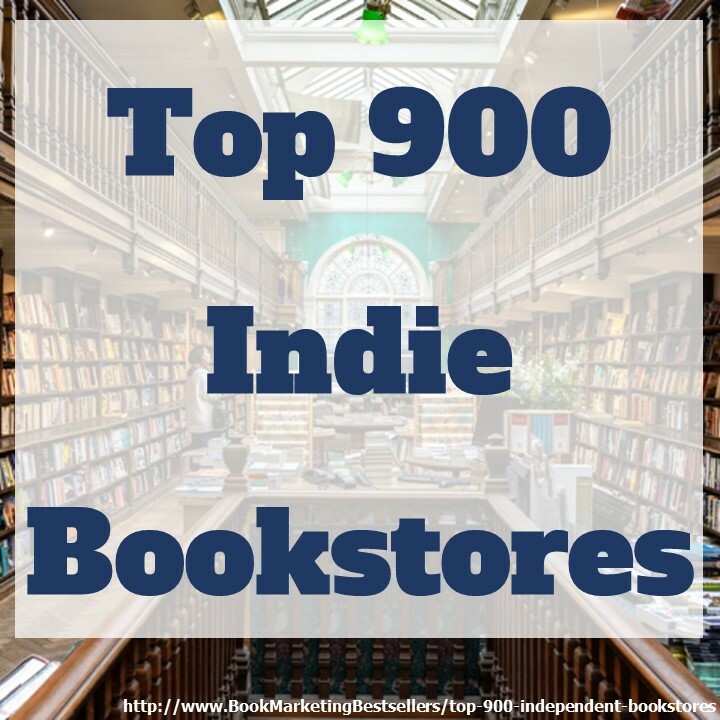 It’s a great opportunity to sell autographed copies of your books via bookstores. Most bookstores will continue to feature your books even after the event.